Great for a weekend stay. Front desk was very helpful. Room was clean. Also a great location. Pretty close to downtown Bozeman. Where to find Bozeman hotels near an airport? How can I find hotels in different Bozeman neighborhoods? Where can I find hotels in Bozeman that are near tourist attractions? If you're after upscale or budget accommodation options in or around Bozeman, it is useful to know that there is a wide range of possibilities. If you are looking to stay within a 0.1-kilometre (0.06-mile) distance of the center of Bozeman, Expedia offers 26 hotels within that area. Visitors looking for a hotel close to the center of Bozeman, should check out the latest offers at the Element Bozeman and The LARK Bozeman. With 4 Expedia-registered accommodations, Belgrade is the area with the biggest selection of Bozeman accommodations. Belgrade is situated 16 kilometres (10 miles) from the center of town. Places to stay in Belgrade are the Holiday Inn Express Hotel & Suites Belgrade and La Quinta Inn & Suites Belgrade / Bozeman Airport. Livingston around 35 kilometres (23 miles) away is where you'll find Yellowstone Valley Lodge, an Ascend Hotel Collection Member and Comfort Inn Livingston. 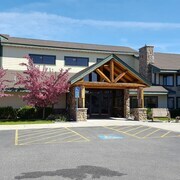 Hotels in Three Forks include Sacajawea Hotel and Lewis & Clark Motel of Three Forks. Three Forks is 45 kilometres (28 miles) away. Thrifty travelers rejoice! 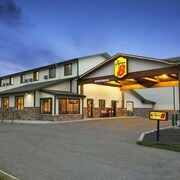 The Bozeman area offers plenty of economical hotel establishments. 1 kilometre (1 mile) away from Bozeman's downtown is the Lewis & Clark Motel Bozeman. The Days Inn and Suites Bozeman is just 2 kilometres (1 mile) away. 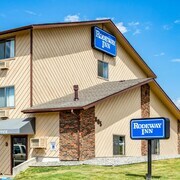 The Western Heritage Inn of Bozeman and the Rodeway Inn Livingston are amongst the other lower priced hotels that are worth a look. 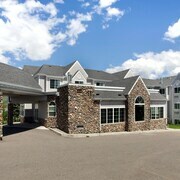 3 kilometres (2 miles) from the heart of Bozeman, is the Homewood Suites by Hilton Bozeman. 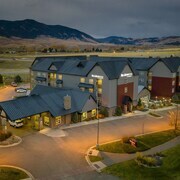 The Residence Inn by Marriott Bozeman is 5 kilometres (3 miles) away. Alternatively, make a reservation at the Hilton Garden Inn Bozeman or the Holiday Inn Bozeman. Why don't you enjoy some more of the lakes, mountains and valleys that are found in Western Montana? Opt to spend a few extra days in some of the other parts of Western Montana. Spend time snowboarding or visit the region's attractions. Comfortable hotel accommodations are on offer. 35 kilometres (23 miles) from Bozeman you will find Historic Livingston, where you'll find Russell Chatham's Gallery and Livingston Golf and Country Club. Should you wish to spend a few nights in Historic Livingston, be sure to check out the Quality Inn Livingston and Yellowstone Pioneer Lodge. 50 kilometres (32 miles) to the southwest of Bozeman, you'll also find Big Sky, which is home to the Alpenglow Condominiums and Park Condos By Resort Property Management. The Big Sky Golf Course and Warren Miller Performing Arts Center are a couple of the most popular points of interest to experience in Big Sky. If you are traveling into or out of Gallatin Field Airport and would like to stay nearby try Super 8 Belgrade / Bozeman Airport or Quality Inn. What are the most popular Bozeman hotels? Are there hotels in other cities near Bozeman? What other types of accommodations are available in Bozeman? Explore Bozeman with Expedia.ca’s Travel Guides to find the best flights, cars, holiday packages and more!